Latest Update: The list of shortlisted candidates for the interview round is released and available on this page below. Shortlisted candidates are required to appear for the interview which is scheduled on 21, 22, & 23 March 2018. Chinese Government Scholarship Application process has been started and the last date to apply is extended from 4 March to 9 March 2018. 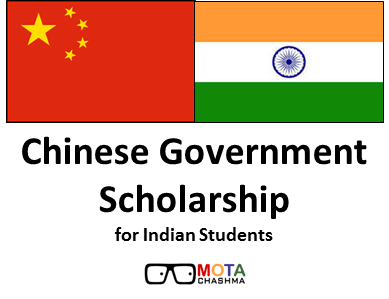 The government of India and Government of the People's Republic of China make a contribution to the scholarship to ensure improvement in the mutual relationship and enrichment of both the cultures. The aim of the Scholarship is to improve the mutual relationships between the two countries by sharing knowledge.The Medium of Instruction in China will be the Chinese Language, therefore, the study of Chinese Language Course of about one year is mandatory before starting study in the relevant subject in the Chinese Language. Candidates should have adequate knowledge of the geographical situation, culture, and heritage of China. Equivalent Foreign Degrees will be considered. Candidates who have already been abroad for study/training or research and living in India for more than 2 years (on 1 April 2018) are eligible for the scholarship. Tuition fee: The Tuition fee will be waived off. Accommodation: For Masters Student CNY 700 and for Senior Scholars CNY 1000 is the accommodation subsidy offered monthly/quarterly. Stipend: For Masters Student CNY 3000 and for Senior Scholars CNY 3500 is the monthly stipend given by Chinese Government. Monthly Grant: Per month supplementary grant of CYN 1170 from Government of India. Air Fare: Government of India will also be bearing the cost of International passage from India to China and back. Note: The above scholarship structure is based on last year data, if there would be any change in the amount of scholarship, it would be updated when available. The Application process for Chinese Government Scholarship 2018 has been started and the last date to apply for the same is 9 March 2018. Chinese Government Scholarship Application form for the Chinese Government Scholarship 2018 needs to be filled on NMEICT's website as well as on Chinese government's Website. A candidate can apply for only one course and one subject. Candidates must submit their research proposal or study plan (500 words for non-degree students, 800 words for postgraduate/ Ph.D. students). Photograph: Scanned copy of the recent colour photograph has to be uploaded and the Dimensions of the photograph should be 200 x 230 pixels. Official Explanation adopted by University: an Official explanation of the grades as per the system adopted by the University or Institution. It is to be noted that the Size of all the Documents to be uploaded must be 530Kb or less. Online Application on NMEICT's Website: After submitting the online application form, the candidate has to fill the application form on Chinese website as well. The link for the same is given below. Candidates are informed to read all the instructions carefully while submitting the form. No Documents or Photographs need to be uploaded while applying online on Chinese Government's Website. Editing the Scholarship Application Form: Changes can be made to the application by clicking on Retrieve Application but after doing that the application has to be submitted again by clicking on Confirmation of Submit. Failure in doing so will make the retrieved application invalid and even the new application will not be submitted. Employed candidates (if they wish to return) should get an assurance from his employer that they will be granted sufficient leave if they are awarded this scholarship during the study period in Korea. Candidates who have also been to abroad earlier for study/research/training of more than six months at a time either on a scholarship or on their own are also eligible to apply only if they have been in India for at least two years after their return from abroad as on 1st week of April 2018. The candidates can apply for the Chinese Government Scholarship 2018 only through online mode on the website at https://www.csc.edu.cn/laihua or www.campuschina.org. The Agency Number must be filled is 3561. After completing the online application form, the candidates need to take two printouts of the completed application form. The printouts along with photocopies of all other required documents should be sent to the dispatching Authorities. Candidates must fulfill the minimum requirements stated above and they might be called for an interview. Shortlisted candidates are required to appear for the interview which is scheduled on 21, 22, & 23 March 2018. Candidates can click on the following link to view the list of shortlisted candidates for interview. The Final selection of the Candidates will be done by Government of the People’s Republic of China. The Decision made will be Final and No objection regarding the same will be entertained. All the information regarding the shortlisted applicants will be made available on Ministry of Human Resource Development’s Website. The candidates are requested to regularly check their emails and MHRD’s website for any update regarding the scholarship.